March Madness, the NCAA College Basketball Championships has begun. The men’s tournament started yesterday Mar. 16th and the women’s series begins on Saturday. Both feature the top 65 US college teams in a 3 week long single elimination tournament. March Madness is easily the most popular college sports event in the country. I think its appeal is due to the large number of teams, which increases the chances of your alma mater participating, and for gamblers, the lure of so many chances to win in a short period of time. It also helps that each successive round cuts the pool in half with the later rounds having the memorable alliterative names like “Sweet 16”, “Elite 8” and “Final 4”. With multiple games happening most days it’s not easy to keep up with the tournament, particularly if you’re working and can get to a computer or TV. Fortunately there’s no shortage of mobile web sites that can help you follow all the action on from your web enabled phone. Here are my picks for the topMarch madness mobile sites. ESPN The mobile sports has separate sections for the Men’s (m.espn.go.com/ncb/) and Women’s (m.espn.go.com/ncw/) tournaments. Coverage of each series includes live play by play, news, scores, schedules, analysis, photos and team and player profiles. ESPN also lists the “Daily Line” point spreads for upcoming men’s games for the benefit of gamblers and has a Tournament Challenge fantasy game with a $10,000 prize for the winner. Yahoo (m.yahoo.com/w/tourney/) is taking a different approach to March Madness this year by featuring a Tourney Pick’em contest with a million dollar price to anyone who picks a perfect bracket. The site also has also live scores, game stats, schedules, news, photos, columnist blogs and analysis. 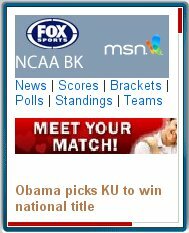 MSN/Fox Sports NCAA Tourney (sports.mobile.msn.com/en-us/NCAABK) is a dedicated March Madness page with news, scores, brackets, standings, team profiles, photos and video highlights. There’s a touch web version of the site at extreme.mobile.msn.com/sports/cbk/ which is available on most phones, not just the iPhone. 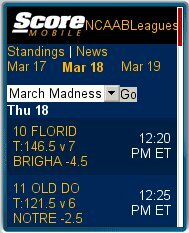 The Score‘s (m.thescore.com/ncaab) auto-refreshing March Madness page shows the latest live scores for today’s games. Click a game to see more details including the betting line. A settings page lets you configure the auto refresh frequency and set your time zone. NBC Sports’ (nbcsports.msnbc.com/id/3152981) mobile college basketball page has extensive coverage of both the men’s and women’s tournaments including scores, feature articles, game recaps and some of the best sports photography on the mobile web. 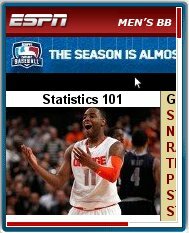 CBS Sports’ (wap.sportsline.com/s/11411/) college basketball page is pretty much dedicated to March Madness while the tournament is on . Besides scores and tournament news the site features videos, schedules by bracket, standings, team profiles and statistics. Links to these sites, and any others I discover during the tournament, can be found on the WapReview Directory’s mobile friendly March Madness page for your mobile browsing convenience. This entry was posted in Sports and tagged March Madness, NCAA Championships by Dennis Bournique. Bookmark the permalink.